So what will it be, Brad Little? 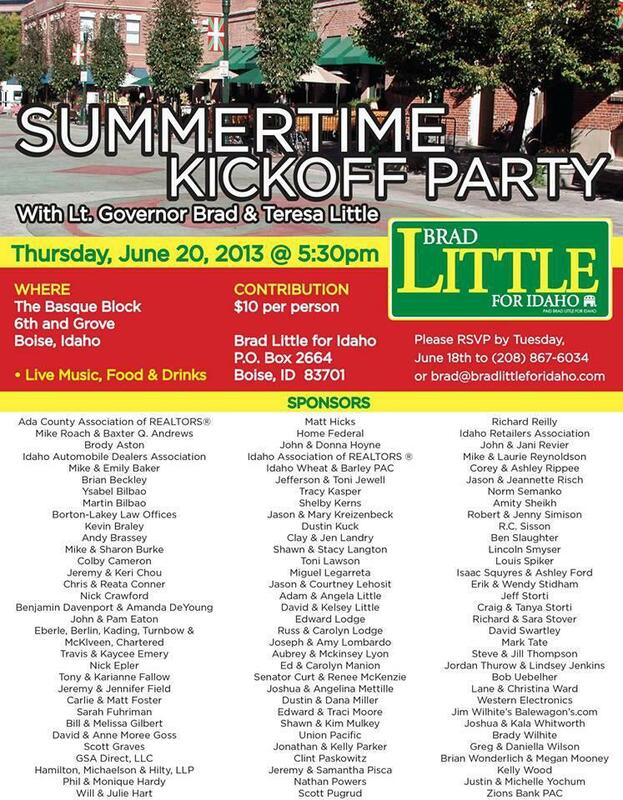 Emily Walton pointed out an interesting omission on a Brad Little campaign fundraiser ad. Neither the campaign literature nor the website specify that Little is running again for Lieutenant Governor in the next election. Little has already confirmed to Dan Popkey that he isn’t ruling out a gubernatorial run if Gov. Otter steps aside in 2014. I sent Little an e-mail asking for comment, and I’ll update if/when he writes back. This entry was posted in Uncategorized and tagged brad little, butch otter, Idaho. Bookmark the permalink. 1 Response to So what will it be, Brad Little? The plot thickens…I think I would love to be a fly on the wall in McCall this weekend. Brad LIttle is a moderate Republican. What will the rwnjs on the Executive Committee have to say about this?